We have developed our member benefits mobile app to make it easier for members to access their benefits, save not only money but also time. The side navigation panel makes it much faster to get where you want to go, whether that be requesting an electrical quotation, using the motor vehicle search facility or viewing locations and exclusive offers from many partners. Our member benefits are only available to members of affiliated organisations. To use the member benefits mobile app, you will need to register for our online services. If you have registered on our website, please also use that login for the app. If you are unable to sign in, it may mean you have not registered online. If you are in store and need a price, the member benefits app makes things nice and simple. Enter the model number, best price and any notes you wish us to see, then add to your quote list and submit to us. Adding to the quote list, before sending, gives you the ability to continue shopping, edit previous information and add other products. Whether you're looking for a new or second-hand vehicle, you can now submit your request on our member benefits mobile app with great ease. Our motor vehicle team will receive notification of your application immediately. They will contact you to discuss options as soon as they are next available. 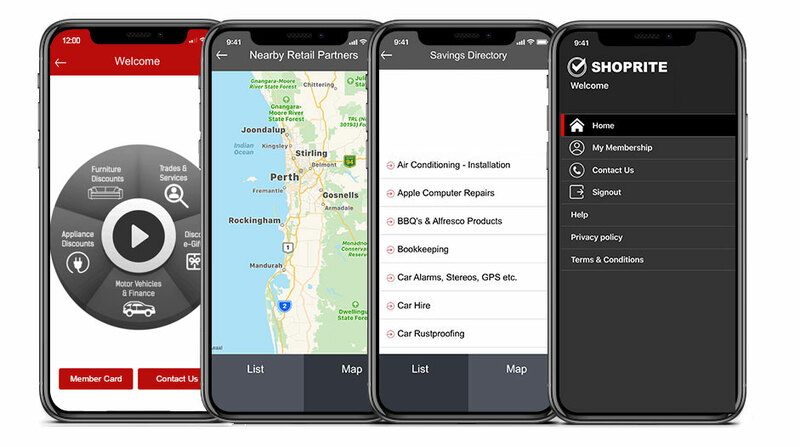 No matter where you are, you will be able to see which member benefits business partners are close to you by clicking on the member benefits app. The list format outlines types of businesses ShopRite offers, as well as locations, opening hours and more. Our app is compatible with iPhones using iOS 4.0 or above or Androids using O/S 2.2 and above.